Review: Do you know what it’s like to be stalked by a mysterious, dreadful person? 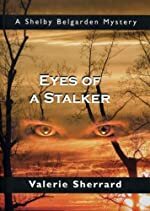 Well, you’ll find out if you read the book Eyes of a Stalker by Valerie Sherrard. In this book, a high school girl named Shelby Belgarden gets some mysterious packages in the mail, e-mails, and even some phone calls from an unknown person with a disturbing message. Although Shelby is being extremely careful about not going anywhere alone and he police are on the case, the stalker still manages to hide his identity. Shelby feels like nothing will ever be the same for her again, and it is all she thinks about. Not only could Shelby be in danger, but also her boyfriend, Greg. The stalker must be caught before he carries out his deadly scheme. Overall, I liked this book. It isn’t the type of book I usually read, but it was pretty good. I liked the characters in the book. The main character is smart, realistic, and someone people can like. I liked the rest of the characters too. They had personalities that showed clearly throughout the story. The setting of this book is in a small town. I liked this because it seemed unexpected for there to be a stalker there. I liked the voice of the story because it sets a mysterious mood. If you like horror movies, you might like this book, because it combines scary and mysterious. That’s part of the reason I liked it. It isn’t quite as violent as a horror movie, but the concept of it is similar. Several of Valerie Sherrard’s books have won awards. Out of five stars, I would give this book a four. It isn’t amazing, since I don’t usually like reading mystery books, but it is a good book. Review written by Melinda, Grade 7. Date of review: April 2009.